Raw food has long been fed to racing greyhounds and huskies, and it has become a growing trend among household pets. Raw food can have some major obstacles, though, so it’s important to be informed when deciding what to feed your pet. Raw food can provide nutritional benefits but when fed under the wrong circumstances can be harmful to your pet or other people in your household. The major benefit of raw food comes from the fact that your pets food won’t be cooked at the super high temperatures that kibble is, thus, retaining a lot of the nutrients. This leaves no need for added synthetic vitamins and minerals that are cooked off in the commercial process of dry food. Raw food diets are also comprised of mostly meat, while many dry dog foods are plant based. Dogs and cats have shorter digestion systems that are not able to absorb all the nutrition of plant foods. Most pet owners participating in a raw diet notice their pets have smaller stools because raw food has less fillers and waste. Simple ingredients that are easy to digest also provides relief to those pets with sensitive stomachs. If not fed properly, however, common nutrition deficiencies can occur. 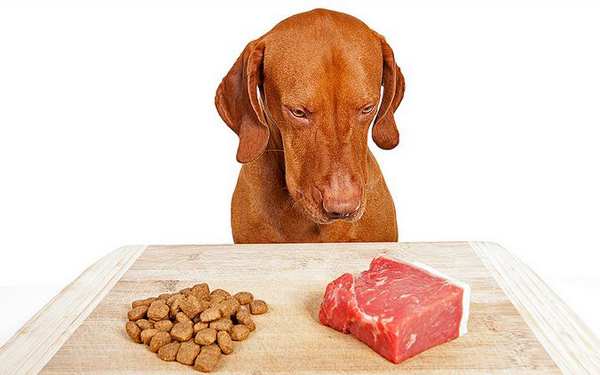 Feeding a raw diet isn’t simply throwing a pound of ground beef into your pets bowl. Symptoms of deficiencies include bad skin, poor coats, and weak bones. The shiny coat that people praise from the diet may be caused by the larger amount of fats consumed, but an improper fat to protein ratio can cause anemia, which leads to fatigue and other issues. Raw meat diets high in liver content can lead to vitamin A toxicity from supplying too much vitamin A. These diets are also typically high in protein and are dangerous for pets with kidney or liver failure. Raw diets can also pose a threat to puppies. Proper calcium and phosphorus ratios are paramount to proper bone growth, so homemade raw diets carry a heightened risk of bone growth deformities. Raw meat is not for everyone. It does carry extra risk of food borne illnesses and therefore should not be used in households of elderly, pregnant, newborns, or people with weakened immune systems. The center for veterinary medicine screened 196 samples of various commercial raw pet food and found 15 cases of salmonella and 32 cases of listeria compared to just 1 case of salmonella and 0 cases of listeria in 860 samples of cooked food. Proper handling of raw pet food is extremely important. Check out our blog here on proper pet food handling techniques. For those with active pets or pets that have sensitive stomachs, there are a few ways you can help your pet receive the benefits of raw food while alleviating risk. You can mix raw food with your dogs dry food, ensure a balanced diet by changing protein sources, and use proper sanitary precautions. Freeze-dried raw food alleviates some of the risk of raw food, and it provides the convenience of kibble. We carry several brands of grain-free freeze-dried food with prices starting at just 1.31 per pound. They make a variety of products that are convenient to use. Our top seller is the meal mixers. Add some extra value to your pets dry kibble with these freeze-dried pellets that are 95% meat, organs, and bone. No need to add water or do any prep. Just scoop and mix. Stella and Chewy’s provide balanced meal with proteins that are cage-free, grass-fed, and/or wild caught with fruits and vegetables that are 100% organic. Sojos have both complete meals, and pre-mix options for people who want to provide their own protein source. They are the most affordable freeze-dried option, but don’t sacrifice quality. An 8lb bag turns into 40lbs of food after rehydrating! A simple and nutritious customer favorite! Use the alpha prey-model diet, whole single-sourced animal protein with no grains, fillers, artificial preservatives, or by-products, because our pets are natural carnivores. They use USDA quality meat that is sourced, made, and packaged in the USA. You will never find added hormones or antibiotics, food coloring, or synthetic vitamins here. Vital Essentials is also top in safety. They are inspected by both the USDA and FDA, and are a USDA approved HACCP food safety program.